League Ambassador Sharon Berrian reads the League Board resolution as Councilman Jefferson looks on. As the Council meeting got underway, Sharon Berrian, the League's ambassador for Northwest Florida, came to the lectern to present Councilman Jefferson with a 20 year pin and to read a resolution from the League's Board of Directors. Ms. Berrian said, "I am the director of membership relations. It is an honor for me to be here tonight to recognize one of your great city officials. Tonight I have the honor of recognizing Eugene Jefferson, councilmember for 20 years of service." Ms. Berrian gave Mr. Jefferson 20 year service pin. 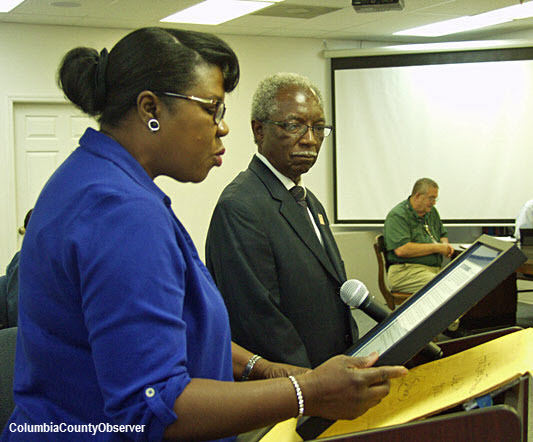 She then read a resolution from the League's Board of Directors, "This is a resolution of the Board of Directors of the Florida League of Cities, Inc., honoring Eugene Jefferson for 20 years of elected service in recognition of his unselfish commitment to municipal leadership and governance." Ms. Berrian continued, "Several terms in office is a high complement that voters give to an official. With these years of experience comes a strengthening of wisdom, discernment, and strong leadership skills that brings tremendous value to the municipal governments of Florida." 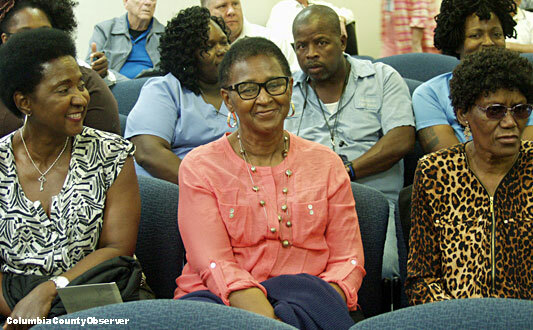 Betty Jefferson (middle), a tough campaigner for her husband, looks on as Mr. Jefferson received the award. Ms. Berrian concluded, "Eugene Jefferson has held office in the City of Lake City for 20 years and is recognized for this achievement and recognized as an outstanding public servant in Florida." After the meeting, Councilman Jefferson told your reporter that when he attended the League Conference in August he had no idea that the League Board had voted to give him the award. He said, "I'm thrilled and surprised."